Come in, kick back, stay a while....if this cabin could talk, that's what you'd hear! Grab a chair or a rocker on the welcoming front porch and listen to the distant crow of a rooster or sit on the beautiful covered back porch overlooking the dense, lush forest, enjoying your favorite beverage with someone special. Inside this cozy, quaint cabin you'll feel right at home. The living room has a wood burning fireplace and a 42" flat screen TV and DVD player. The kitchen has everything you could possibly need to prepare some great meals. The dining room will absolutely captivate you to actually sit down with family or friends and enjoy a meal together, something that has become a thing of the past for most. The King Master on the main level is spacious, has a 37" flat screen TV, and walk-in closet. There is also a full bath with tub/shower combo on the main. Downstairs hosts the game room with a pool table and the lower deck with the large luxury hot tub. There is a Queen Bedroom on this level as well as another bedroom with full size bunks. There is a large bathroom with a jetted tub and adjoining laundry room for added convenience. 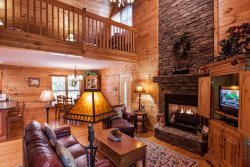 Bear's Den is conveniently located 10 minutes from downtown Ellijay and 15 minutes from downtown Blue Ridge and has all paved access making it the perfect choice for those not so fond of our North Georgia terrain! Fully equipped kitchen: Refrigerator, stove, oven, microwave, NO DISHWASHER, toaster, coffee maker, dishes, glassware, utensils, cutlery, pots, and pans. Linens for each bed, 2-bath towels, 1-hand towel, 1-washcloth per person listed on guest list, dresser or closet for clothing storage, central heat & air, washer/dryer, vacuum and/or broom and dust pan, mop, cable or satellite TV, internet, telephone for local calls and propane grill. We loved staying at Bears Den! Everything was as described. Such a beautiful well appointed cabin with everything we could need. Very clean also. It was the perfect fall mountain getaway in beautiful northeast GA. The place was clean and very nice. This cabin was conveniently located near both Ellijay and Blue Ridge. It is charming. It was immaculate. There are lots of amenities including the hot tub and pool room. I loved sitting on the back deck nestled in the woods. The kitchen was well equipped. Great customer service, absolutely beautiful cabin. They had thought of just about everything you could possibly need. One suggestion: bath robes. Overall a great trip. We'd come back. Always happy staying at ur cabins. Very pleased with service. We have booked with a few different management companies over the years. By far, this was our best experience. Clean, Close to Town, Cozy, & Affordable Bear's Den was a great spot to stay for our family of 7 while on evacuation from hurricane Irma. We enjoyed sitting on the front porch in the morning & by the fire on the few cool nights we had. We also enjoyed the convenience it was to town & the fact that the road to access the cabin was all paved was nice, too. It was nice to be able to find a place that allowed dogs so we could bring our Havipoo, Lexi. She loved the grass! Overall great place! My husband and I have rented cabins from Mountain Oasis for years. Properties are spotlessly clean, well stocked and the staff is wonderful. We rented from other places in our past travels and truly no-one compares to Mountain Oasis. Our only problem is the word is getting out and the cabins are staying booked. The staff was very friendly and they prepared all requests we needed. We found hornets and their nests in the ceiling area outside the cabin after we've checked in and we called the office during the weekend. The staff was very nice and sent a maintenance guy to get rid of the hornets. Relaxing mountain getaway, it was perfect for a long weekend getaway. This cabin was beautifully decorated exactly what we were looking for. Everything was there for cooking which was great. We loved it. Our recent stay at Bear's Den was very pleasant. The location was perfect. Staff at Mountain Oasis Cabin Rentals have always gone over and beyond to help find the perfect cabin. They are very accommodating. Look forward to our next visit. Cabin was a delightful surprise as we checked in, music playing, candles burning and inviting lighting. Very Nice! Cabin well equipped, all we needed. Enjoyed pool table and hot tub. Enjoyed rain on tin roof as we relaxed on deck. Would highly recommend. To All, just wanted to thank you guys for providing a really nice stay at your cabin recently, Everything was in place and as described. Was impressed with the fact that i didn't have to bring nothing but food and beverage. Awesome accommodations close to everything that we were looking for. Even got to a drive in movie while we were there. Your complete staff was very informative and ready to get the answers if they needed. Most important Everyone was very friendly. Thanks again.